May has arrived and spring is in its full swing. 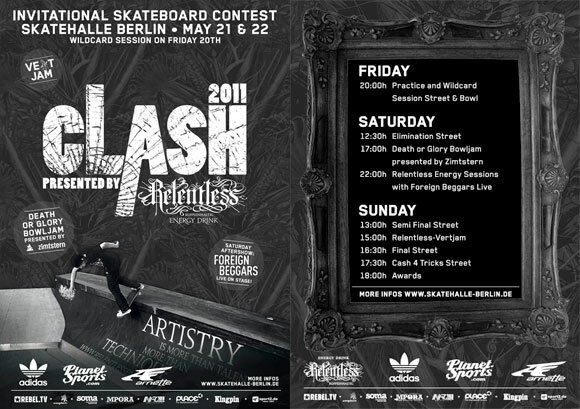 The same applies to the preparations of CLASH 2011 presented by Relentless Energy Drinks. Over at the Skatehalle-Berlin office, the phones are continuously ringing and inboxes are bursting of riders sign-ups. Recent additions to the starters list include last year’s winner Thomas Weber, Flip-child prodigies Louie Lopez and Curren Caples, former Eurochamp and tech wizard Philipp Schuster, as well as vert flippers Renton Millar and Jussi Korhonen. Meanwhile, wood shavings fill the air on Skatehalle's street parcour, where Lennie Burmeister and his gang are swinging saws and screwdrivers and everyone familiar with Lennie knows: his work always results in something freshly unexpected and exciting. ﻿ So you can all look forward to discover what Lennie will come up with and surprise every skater and spectator. Scarcely able to save himself from the flood of requests is Jürgen Horrwarth. 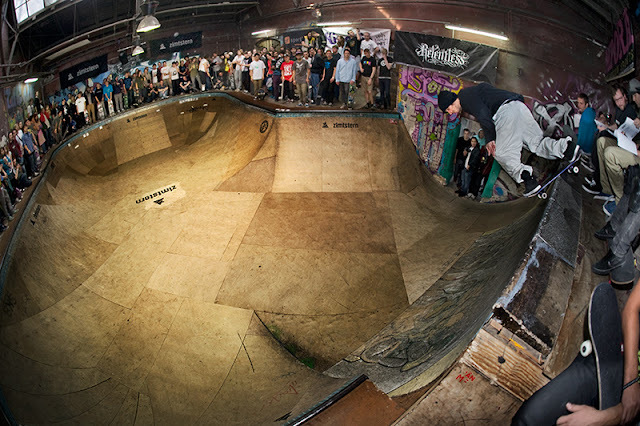 After long years without a vert-comp, ramp skaters from all-over are going crazy for the few spots in CLASH 2011's vert-jam. Those who feel the same way, still have a chance to get their hands on a vert-jam wildcard at Jürgen's shoe-colourway release party by etnies, which is taking place at Skatehalle-Berlin on Friday, May the 6th. Heavy ammunition is what the entertainment department of CLASH 2011's organisation-crew is dropping, as they just announced, that Saturday night will be all about OAF! – Antiz, the heavy-metal band amongst skateboard brands, is asking you out for their video premier at 21:30h. Be there for occasional Antiz flashbacks with Hugo Liard, Steve Forstner, Julian Furones, Sam Partaix and the rest of them. See the list of the bowl and vert riders after the jump.